If you’re looking for an honest review of Aquascape pumps, you’ve come to the right place. Since we use Aquascape pumps in all of our water feature installations, we know the good and the bad, and which pumps have issues and which don’t. So lets take a look at a few Aquascape pumps and see what we really think, so you can make an informed decision. The best feature of the Tsurumi pump is that it is 95% clog free! 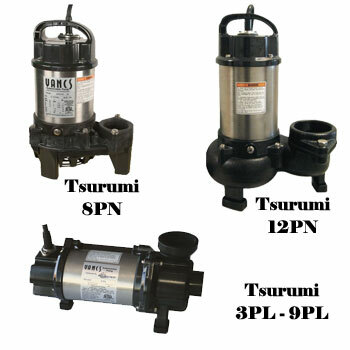 We have noticed only one problem with the Tsurumi pumps, specifically the 12PN. The problem was that it was sucking up rocks and then damaging the impeller. But overall, we have not seen any other problems with the Tsurumi pumps, another reason why this is our water feature construction foreman’s favorite! A better impeller. Even though these impellers are quite sturdy, an impeller made out of something stronger to take the damage created from sucking up rocks, would be amazing. We would also like to see a better screen on the 12PN, so larger items wouldn’t get inhaled by the Tsurumi pumps….frogs and rocks specifically. The remote control along with the adjustable flow, can’t get much easier than that! These adjustable flow pumps are nice because you, the client, can adjust the flow of the pump. So, if you’re not around enjoying your water feature, you can turn it down, not only does this save energy, but this makes them more efficient and quieter. 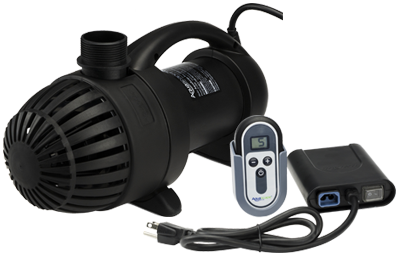 The AquaSurge pumps use an oil free design, making them very eco-friendly, and they can also be retrofitted to fit in the skimmer box, or vault, horizontally or vertically. We have noticed that the AquaSurge pumps collect scale build up, which can easily be treated, and better yet maintained, with an AutoDosing System. We have also had issues with the motor seizing, which depends on the water quality. The AquaSurge pumps have also had a tendency to get clogged much easier than the Tsurumi pumps. The AquaSurge pumps actually work really great, but they tend to get clogged easy. A debris net around the pump would help the clogging issues. If you’re having problems with your pump, or looking to put a water feature in your landscape contact us today!